Swarms are exciting! It is the birth of a new colony. Want to report a swarm? – Please notify me via the contact form below. Honey bees are a valuable asset, and a beekeeper would be able to give a swarm a good home with good care. Before leaving the original colony, honey bees gorge on honey for the journey to move to a new home. Generally speaking, they not very defensive. However, they can be enticed to sting. Please, do NOT spray with poisons or try to kill them. Swarms are only in a temporary resting place until they rest enough to move on to their final destination. 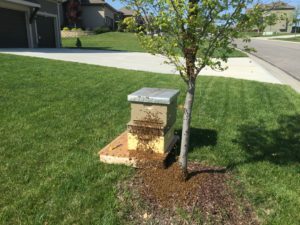 Swarming activity is a very common occurrence in April and May. Many people find them in their yards on trees or bushes or other places. Swarms can be harmed by high winds, hail, and heavy rains as well as sometimes cold, freezing weather. As a public service, and free of charge, I will be more than happy to remove or pick-up your un-welcomed honey bee swarm! I am available in Johnson, Wyandotte, and Miami counties in Kansas, as well as eastern Jackson and southern Platte counties in Missouri. I will even try to leave you with a small jar of honey for your effort. I have 45 years experience working with honey bees. Find a swarm of honey bees? Do not disturb or spray the swarm with water, soap or insecticide. Stay calm. Try to understand what is happening, and that swarming honey bees are not defensive or dangerous unless you might disturb them. A swarm will usually move from the original location within 24 to 48 hours; therefore, if a beekeeper is not available to collect the bees from a homeowner’s property, the bees will normally leave without causing a problem. Submit the ‘contact form’ below, and I will receive immediate notification via email through my mobile device. I’ll be in touch with you in short order. Thank you for your notification! If I am unable to come get the swarm, I will pass on the information to another beekeeper who can be of help. For swarms in other areas of Kansas outside of my region, please use this list from the NEKBA or Kansas State University link for a list of other beekeepers throughout Kansas that are also looking for a swarm. As a disclaimer, I cannot assume responsibility related to the swarm collection or extraction activity, and I shall be held harmless for any actions or activities related to any honey bee collection, including but not limited to information used, liabilities, or resultant damages, injuries, or bodily harm that might occur. Thank you!